What Are the Best Trees to Increase Your Curb Appeal? What Are the Best Trees to Increase Your Curb Appeal? What Are the Best Trees to Increase Your Curb Appeal? The redwood trees in California, gum trees in Australia…there are so many species of trees to choose from when planning your landscape, and Maryland’s climate is generally enough to house them all quite well. Trees breathe life, literally, to the Earth. They’re beautiful and majestic, standing tall and reminding us of the ancientness of our planet. The redwood trees in California, gum trees in Australia…there are so many species of trees to choose from when planning your landscape, and Maryland’s climate is generally enough to house them all quite well. What tree is going to keep your house looking the best? Read on to find out! You probably mistake these trees for Evergreen, because they look just like Christmas trees! Their cone shape and thick branches are ideal for housing birds, so you can admire wildlife. They’re also resistant to deer because the animals can’t eat anything off the prickly branches. They can grow just about anywhere, and are resilient during every season. In Maryland, you’re probably familiar with D.C.’s annual cherry blossom festival, when the entire center of the city is coated in beautiful pink petals. This pastel tree blooms in Spring, and comes in a lot of pretty colors to keep your landscape looking delicate and soft. They’re subject to caterpillars and don’t like soil that isn’t well-draining, but they’re still very sturdy and will hold up to many conditions. Not just for Canada anymore. Maples are strong and tall trees that explode outwards when they’re fully grown. As an added charm, their leaves turn to brilliant reds and oranges during the fall, which is sure to turn heads. Maples can also take many different environments and are perfect for Maryland’s temperate climate. If cherry blossoms are a little too overwhelming for you, magnolias are a nice alternative. They’re not quite as large, and don’t house as many petals. They’re equally as hardy as cherry blossoms, and only bloom for a short period, so you won’t be spending weeks picking pink petals out from under your windshield wipers. Need trees planted? Call Atlantic Maintenance Group today. 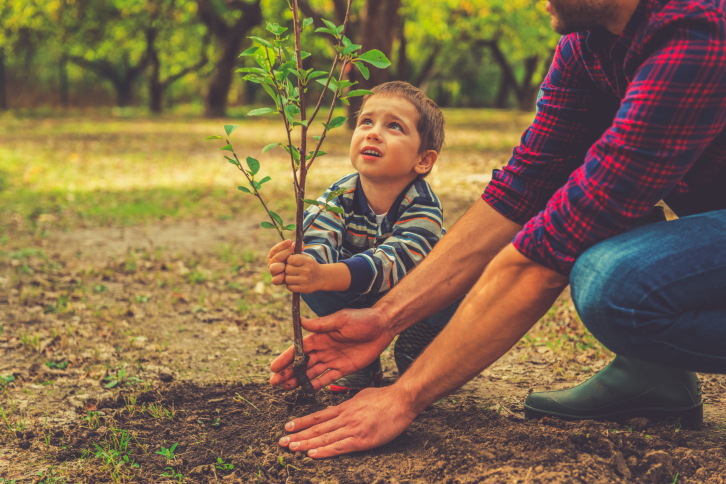 We’ll plant trees, shrubs, and care for them the way they need to be cared for. Atlantic Maintenance Group offers a wide variety of services, from flowers to ponds and back again. If your landscape needs help, we’re on our way. The Atlantic Maintenance Group offers quality landscape, asphalt, snow removal and concrete maintenance services. This entry was posted on Friday, July 1st, 2016	at 5:47 pm	and is filed under Landscaping Design, Tree Care	. You can follow any responses to this entry through the RSS 2.0	feed. Both comments and pings are currently closed.